New Light Presbyterians founded the College of New Jersey, later Princeton University, in 1746 in order to train ministers. The college was the educational and religious capital of Scots-Irish America. 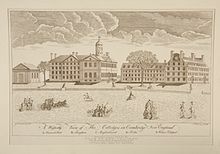 In 1756, the college moved to Princeton, New Jersey. Its home in Princeton was Nassau Hall, named for the royal house of William III of England. Following the untimely deaths of Princeton’s first five presidents, John Witherspoon became president in 1768 and remained in that office until his death in 1794. During his presidency, Witherspoon shifted the college’s focus from training ministers to preparing a new generation for leadership in the new American nation. To this end, he tightened academic standards and solicited investment in the college. Witherspoon’s presidency constituted a long period of stability for the college, interrupted by the American Revolution and particularly the Battle of Princeton, during which British soldiers briefly occupied Nassau Hall; American forces, led by George Washington, fired cannon on the building to rout them from it.